Lin Jia, Ph.D. L. Ac. Licensed acupuncturist and herbal specialist in Texas. Medical doctor (neurologist) in China. 20 years experience in China and USA. Former attending physician and director of Acupuncture Pain Management Clinic in Beijing. 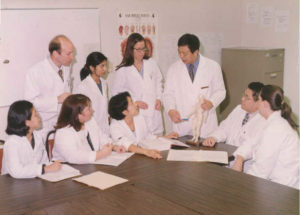 Medical degree in Chinese medicine from Hei Longjiang University of Chinese Medicine. MS in acupuncture, Tui-Na, and Acu-pressure from Institute of Acupuncture, in Beijing. Ph. D. in molecular medicine, Pasteur Institute, Paris. Member of TAAOM and the World Federal Association of Acupuncture. Author of more than 20 papers and books related to acupuncture and life science. Medical doctor, specialized in gynecology, in China. Co-Researcher with Baylor College of Medicine of Osteoarthritis Treatment with Acupuncture study funded by NIH. Teaching Acupuncture and Chinese Herbology in Baylor College of Medicine. Former Chief Physician in Expert Clinic at China Academy of Chinese Medicine, Beijing. M.Med. in Chinese Medicine from Hei Longjiang University of Chinese Medicine. Author of more than 16 papers and books related to Chinese Medicine.